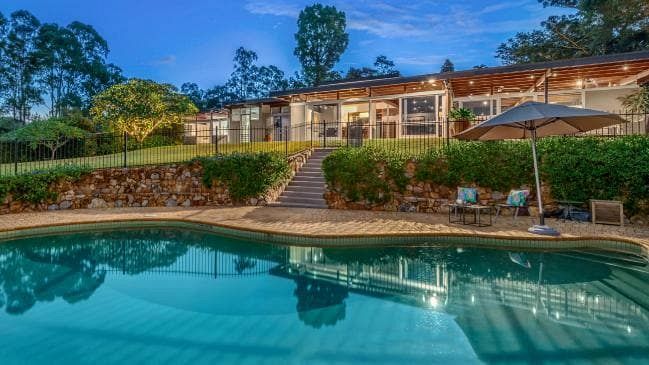 A GIANT riverfront estate in one of Brisbane’s most expensive suburbs has sold for the first time in three decades — kicking off what’s set to be a bumper year for the city’s prestige property market. The sprawling property in exclusive Fig Tree Pocket is understood to have sold for close to $5 million, but the actual sale price is being kept under wraps due to a strict confidentiality clause. Alex Jordan of McGrath Estate Agents, who negotiated the sale in conjunction with Damian and Sarah Hackett of Place Estate Agents, said the property attracted inquiries from interstate and internationally, but sold to a private local buyer. The new owner of the 8726 sqm estate at 630 Jesmond Road is in good company with the likes of billionaire businessman and former politician Clive Palmer paying $7.5 million for a riverfront mansion in the suburb last year. With a median house price of $1.14 million, Fig Tree Pocket is known as a high-end housing area for some of Brisbane’s top business leaders, offering sprawling homes with recreation facilities such as equestrian fields on acreage. Mr Jordan said it was rare for such a large parcel of riverfront land that was not floodprone to become available. Former owners Anne and Martin Nothling bought the property 32 years ago and were reluctant to let it go. “It has always been in the back of our minds that this block could be subdivided but we wanted to maintain the ambience of the Fig Tree Pocket area by keeping this large block intact,” Ms Nothling told the Courier-Mail. “The added insurance of being well above any recorded flood gave us peace of mind. The California-inspired architect-designed house was built in the 1970s and has a covered entertaining terrace that overlooks a pool and lush lawns to the Brisbane River below. The home has four bedrooms and three bathrooms, plus separate guest quarters and a tennis court. Open plan living areas include a casual dining area, living room with fireplace, formal dining room and media/rumpus room. There are clerestory windows and tall glass doors and windows which allow river views. The property has a 38m wide river frontage with a deep water pontoon.